Authentic, Tex-Mex, fast(ish) food, tacos made at home by someone with red hair, freckles & zero Latin/Hispanic heritage…I’m not picky. I love it all. If it has beans, salsa, and chilis, I’m pretty much guaranteed to be happy. 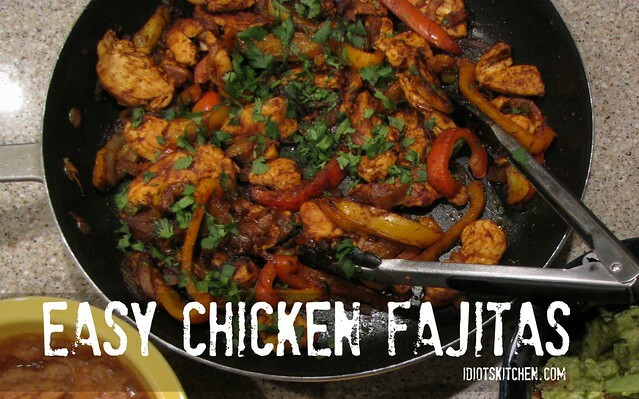 Easy Chicken Fajitas are one of my quick go-to weeknight dinners. 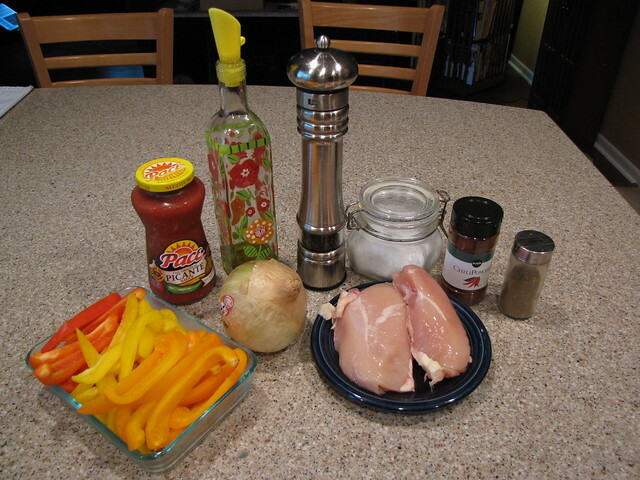 Chicken Breasts, Onions, Bell Peppers, Olive Oil, Chili Powder, Cumin, Salsa, Salt & Pepper. You will also need all the fajita fixins (not pictured here) – tortillas, cheese, beans (sometimes black, sometimes refried), guacamole, sour cream, cilantro, etc. This is obviously not about being super authentic, it’s about getting a good dinner on the table. I’m not at all apologetic about using beans from a can and salsa from a jar. 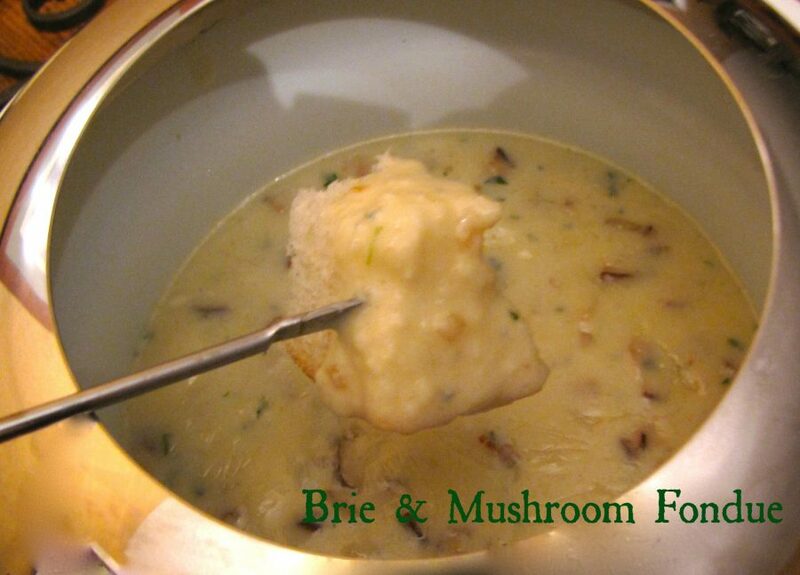 If you have the time to make homemade, great. However, when I make homemade salsa it never hangs around long enough to make it into something like fajitas. 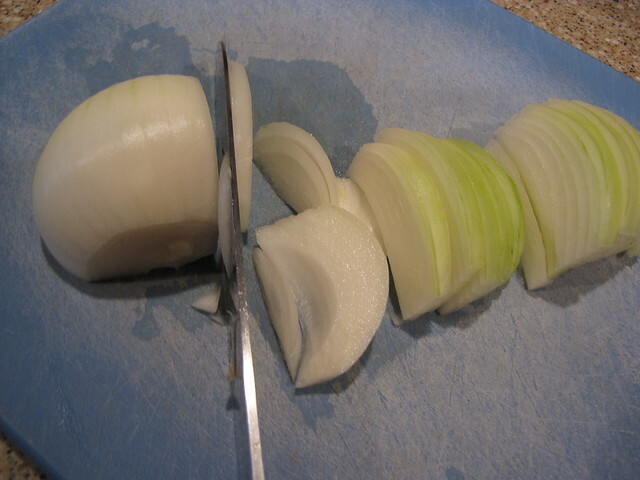 Cut a large onion in half and then cut across the top of the onion to make little half rounds. These will separate into slices as they go into the pan. While you’re chopping, cut up 2 sweet bell peppers. 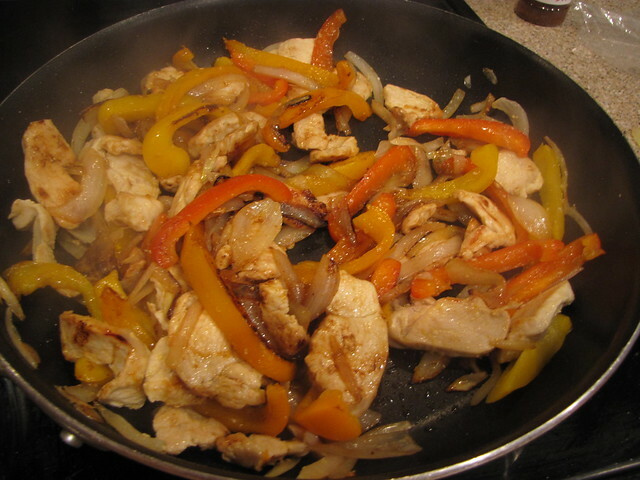 Red, yellow, or orange – The color is up to you but I avoid green peppers as they can be slightly bitter when cooked. I have 2 large chicken breast halves. 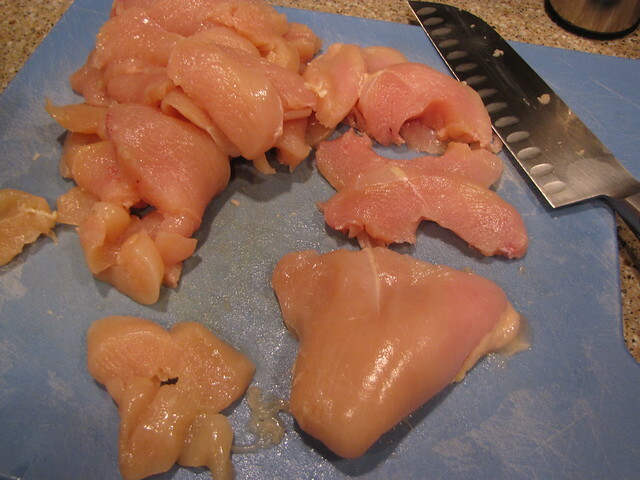 Trim off any excess fat and cut the chicken into thin strips. Heat 2 Tablespoons of oil (I’m using olive oil here) in a very large pan over medium high heat. 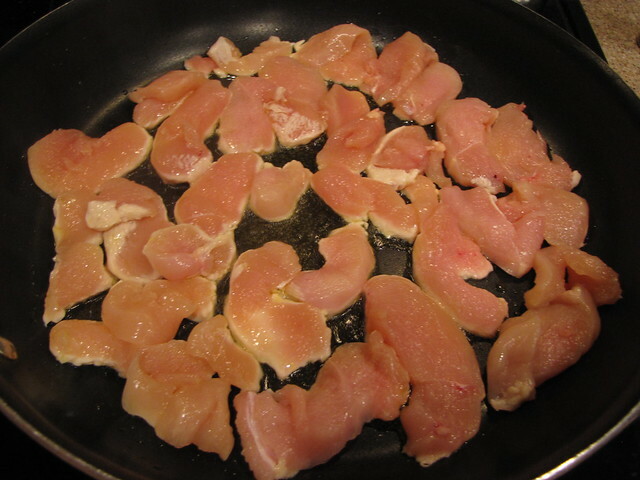 Add the chicken, turn the heat up to high, and cook quickly until golden brown. Be sure not to crowd the pan or the chicken will steam. If your chicken happens to be releasing a lot of liquid, turn the heat up just a bit. 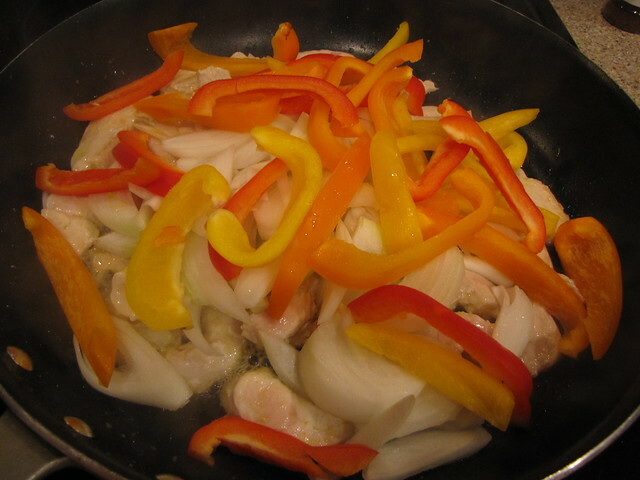 When the chicken is browned on the first side flip it over and add the onions and peppers to the pan. By this point, you want your pan to be REALLY hot. Let the chicken, onions, and peppers carmalize a bit as they touch the hot surface then give them a stir to get those lovely browned bits all over. 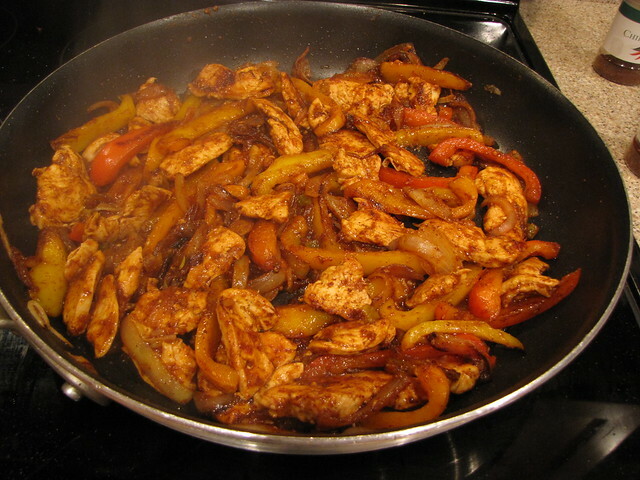 When the chicken has cooked through and the peppers and onions have softened (usually about 8-10 minutes), season the fajitas with 2 Tablespoons of chili powder, 1 Tablespoon ground cumin, and salt & pepper to taste. Add about 1/2 cup of good chunky salsa and turn the heat down to low. Stir to combine then let the fajitas simmer for a few minutes more to absorb the spices. If you like things spicier, I highly recommend adding a few shakes of chipotle chili powder. If you just want the smoky flavor but not the heat, toss in a little smoked paprika. 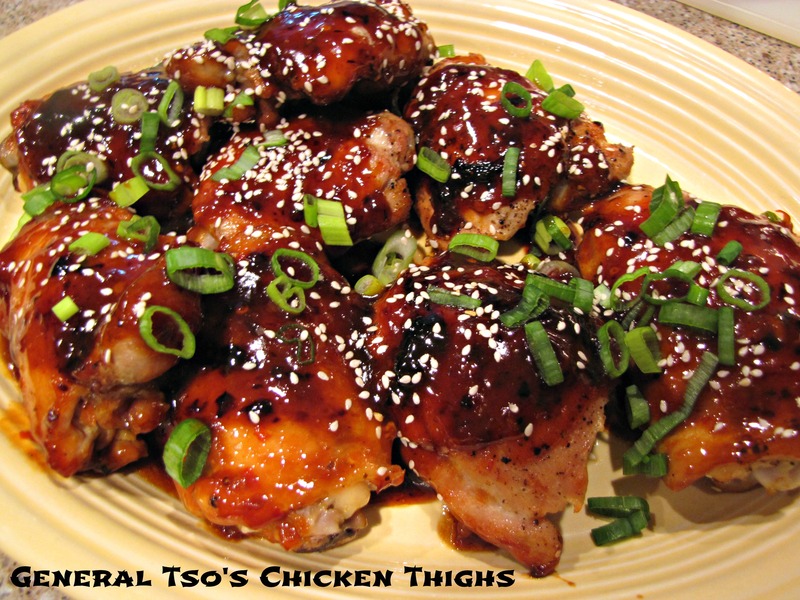 Please taste and adjust the seasonings to your liking – especially if you’re cooking this for kids. Don’t want to heat up your kitchen or risk Fajita Hair? 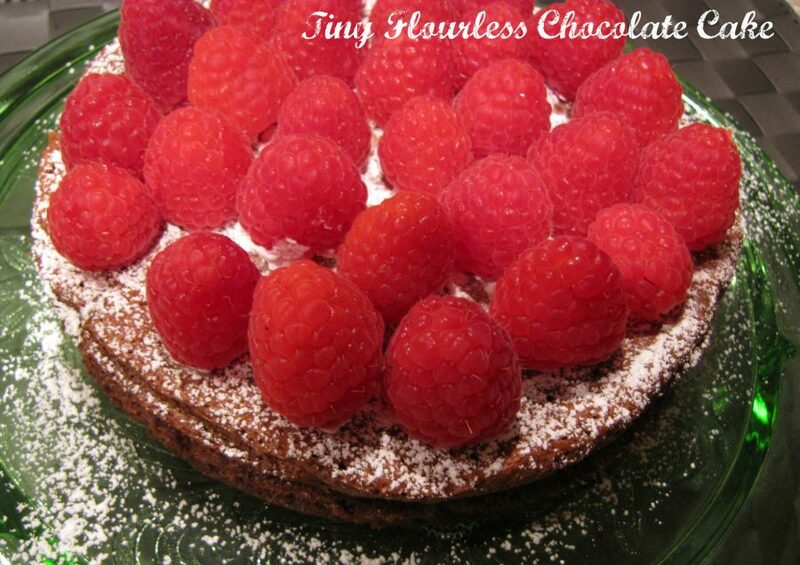 I often make these on the grill in a metal grill basket. Just stir in the salsa after you take everything off the grill. 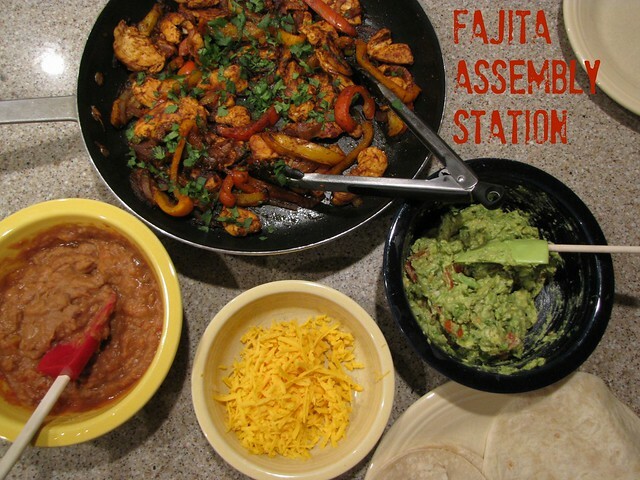 Make your Fajita Assembly Station on the counter or table and let everyone serve themselves. I have the traditonal flour tortillas for Jim and corn tortillas for me that I’ve warmed in a damp paper towel in the microwave. I’ve heated up a can of refried beans and thinned them out with a little salsa to make them more spreadable. If I have it, I’ll crumble up some Queso Fresco but most of the time good old grated cheddar or pepper jack makes me happy. One thing I absolutely make from scratch is my guacamole. If I don’t have ripe avocados, I’d rather skip it than have bad guac. That’s it! 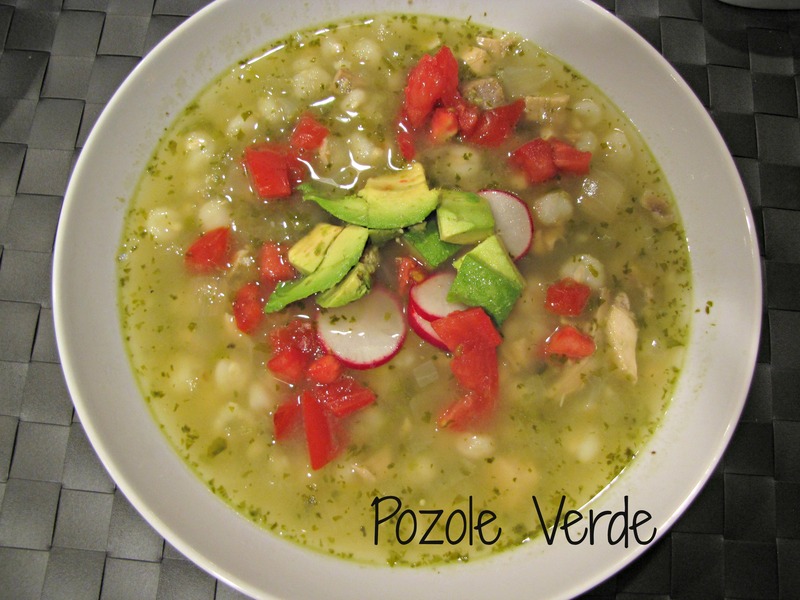 Load up your tortillas and dig in. See if you have more self control than I do…my tortillas are always too fat to roll. Claudia, you are the only American Woman I know in the 50 years that I have lived here who cooks fabulous home cooked meals. Congratulations to you! Your Husband is one lucky fellow! Plus you also have the best looking yard in our street! With blooming things. That you take care of! And you know how to play classical music in an orchestra!